In tandem with Nuit Blanche, iconic Mile End bookshop Librairie Drawn & Quarterly partners with Montreal-based publisher Metatron for a gathering of nighthawks and poets. 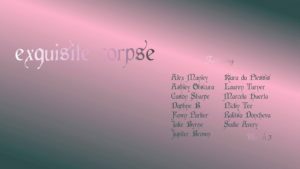 Festival-goers are invited to experience ‘Exquisite Corpse’—a surreal evening of collective curiosity. Known for their unique and dynamic events, Metatron has curated an evening that will not only feature an interactive, digital, collective writing experiment, but also a marathon-style reading featuring a dozen young, local writers. Come for a bit or stay for the whole thing! We have a numinous evening in the works to stimulate your mind with exquisite musings!